Creative? Unorthodox? Obnoxious? Probably all of those things would describe the groundbreaking ceremony of a unique Texas-based Cadillac dealer. But such things are required to stand out in the world of automotive retail. 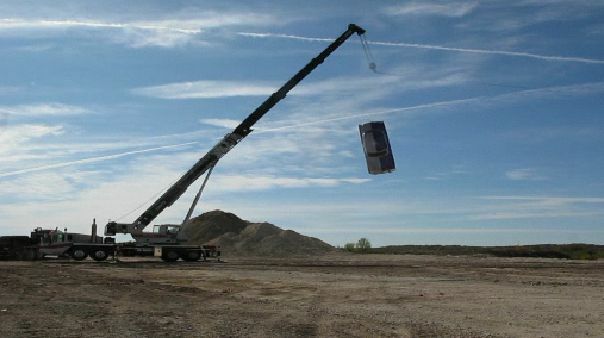 Instead of a couple of suits equipped with shovels who end up barely puncturing dirt in order to drink some cheap champagne, the planners in charge of the groundbreaking ceremony thought it would be fun to drop a 1953 Cadillac Fleetwood (we think it’s a Fleetwood) from a crane suspending it 53 feet in the air. The Fort Worth, Tex. dealer, Frank Kent Cadillac, is expected to open by Sept. 15 of next year. Next story Community Question: How Would You Change The Chevy Traverse? I have a idea lets promote our new Cadillac dealership by smashing a 1953 Cadillac! Johnson you are brilliant! someone give that man a raise. I watched this and I couldn’t believe it. So like a dummy I watched it again and it angered me even more the second time. Call me crazy but I don’t like watching something I like destroyed. I think it would have been better if the car was restored then have a giveaway on opening day. That would have brought Cadillac people to see car, dealership. I, actually hate the old finned pink land barges Cadillac use to make. As I see it, the cars they make now are infinitely better than those cars ever were. Its the kind of stoggy, kitch, googie-era image Cadillac has been trying to uncouple itself from since 1999. They can cherish their past, but they can’t live in those times ever again. Cadillac should put us at the forefront of technology and luxury, not try to hook us back into the mid-50’s with cars that were, frankly, kinda vulgar to look at. It would have been better to have dropped a limp wrist-ed import,to show how the Caddy’s,in particular,the CTS-V’s will smash the completion.How’s that ATS coming along?